You are here: Home / Around Amma 2002 / An ordinary lunch stop? Sometimes travel stops with Mother hold delightful surprises, precious and unique events — like the time last year when She sang under a full moon, and then practically danced, arms outstretched, to Her car. But much of the time these stops are what would pass for ordinary family outings were it not for the fact that the Mother here is Extraordinary, and Her children number about two hundred. Take the lunch stop on the way from Trivandrum to Madurai. In the afternoon, the travelling group of westerners and Indians, ashramites and visitors alike, reached a shady palm grove, and clambered out of the buses, ready for a stretch. 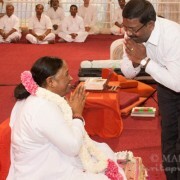 “Amma said to serve lunch at 2:30,” announced one of the people in charge. So everyone lined up, tiffin in hand, and moved towards the big vessels of rice and curry. Small groups formed here and there, individuals went off alone, many people just stood looking uncertain. To eat or not to eat? Most chose to wait, saying, “She said ‘serve,’ She didn’t say we had to ‘eat. '” They wanted to wait for Her. If Amma had already arrived, there would have been no small groups, few people off on their own-just one huge “flower” (this is Amma’s own metaphor) encircling Mother in Her red folding chair. But on this particular day, She arrived about an hour later. Having reached Her chair, Mother looked around at all Her children. “No eat?” She asked. Most hadn’t. “Gita,” She directed, and the fifteenth chapter, always chanted before meals, blended softly with the soft sound of the breeze in the treetops. Mother, as She usually does during this chant, let Her gaze glide slowly over all the faces before Her (and to the sides as well). She let play a soft smile, barely visible; Her eyes were alert, probing, twinkling, questioning, encouraging-offering whatever each face they rested on needed. The Gita finished, Mother led the group in the usual blessing-and even those visitors who had not memorised the long Sanskrit chapter of the Gita, and so had been silent before, could now join in. The family lunch proceeded much as usual, with Mother asking for information (“How long did people have to wait for the buses to leave Trivandrum?”), interpreting the replies (“Two hours? Too long! Loading problem.”), making decisions for solutions (“Mother will direct the packing and loading next city”) and beginning to take action (“Who will volunteer to help loading next time? Hands up! Write the names!”). 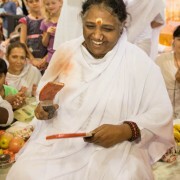 This is Amma: be attentive, see a need, take action. 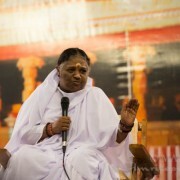 This Mother who paid attention to the small problems of the people travelling with Her is the same Amma who saw people without decent shelter and began the Kuteeram project (building twenty-five thousand homes for the homeless across India), who saw that widows are too often destitute (and initiated a widow’s pension plan to provide them with a monthly stipend), and who understood that the India of the future will require a huge supply of computer-literate men and women (and established her various computer institutes and technical institutes, complete with scholarship programs for the poor). Another side of Mother emerged as lunch went on. She saw one of Her young daughters who has been away at college in Trivandrum, and wanted her to tell everyone about some of her humorous experiences. The girl was terribly shy, and though Mother encouraged her to try to talk, she finally gave up, laughing, and hiding behind her hand. At that point, Mother asked another of the brahmacharinis to narrate the girl’s story. Listeners seemed delighted with the simplicity of the events and the childlike innocence of the college girl. The love and warmth radiating between Mother and this recently-out-of-the-nest daughter were lovely. It is amazing how Mother manages to make connections with so many of Her children in such a big group. Earlier She had called the people responsible for loading the buses; then She had asked to see the hands of all who work throughout the night in the bookstall and food preparation areas; next She took the names of loading volunteers, pausing to focus in on one fellow who was offering to help despite the fact that he had fallen from the roof of the bus doing just that job that morning! “You OK?” She asked him. “Health OK?” And She grimaced and made the same faces and noises any mother does when her child gets hurt. With that promise of another gathering of the family before reaching Madurai, Mother rose to go to the camping car. She managed to pat the heads of a few more people as She passed them, spoke to some others along the way, stood for a while in the doorway of the camper calling out to yet more of Her children, and at last left. With more than two hundred in Her big family on this particular tour, She can’t possibly speak to or touch each one-but it’s amazing what She CAN do in one ordinary lunch stop!